What Female Animal Eats Its Young? The eating of offspring is one of nature’s grim realities. Filial cannibalism, where an adult eats one of its young -- either as an egg, live young or deceased offspring -- proffers a number of benefits to the adult, such as removing weak offspring from the gene pool and providing sustenance to the parent during times of food scarcity. Females often act counter to their natural maternal instincts, especially when under stress, and will eat their offspring. Female sticklebacks, long-tailed skinks and house finches have each been observed eating eggs that they were previously protecting. In the case of the long-tailed skink, stress is a primary driver in this behavior. When repeatedly threatened by predators, the skink switches from protecting the eggs to consuming them herself. This potentially indicates that she has elected to divert her energy from protecting the eggs and instead elects to gain the sustenance that the predator was seeking. House finches and sticklebacks typically consume eggs either as a means of sustenance or to remove less viable young from the gene pool. Female hamsters regularly switch from nursing their pups to killing and eating them. When the hamster determines that the energy required to raise the pups is more than the energy gained by eating them, she will cannibalize her entire litter. The benefit of doing is to give herself a better chance of raising a viable future litter, rather than expending energy and time raising a less viable litter. Bank voles have been observed eating weak offspring while continuing to care for their siblings. Burying beetles, who lay their eggs on dead animals, may be the least patient parents in the insect world. When their offspring beg for food -- by manipulating mom’s mouthparts with their legs -- too much, the female adult is driven to kill them. But rather than see the effort of producing the offspring and raising it thus far wasted, she will also eat them. Female wolf spiders carry their eggs in a sack on their abdomen, then carry the hatchlings on their back. These burrowing spiders regularly eat their young if they cannot find sustenance elsewhere. Primates have strong paternal instincts and filial cannibalism is rare, but it’s not always the case that adult females need to kill their young in order to eat them. In some cases, eating deceased young is merely way of gaining sustenance and avoiding resource waste. 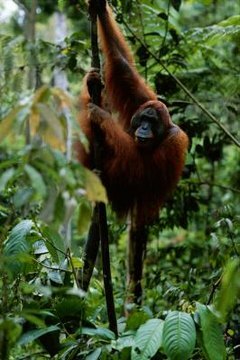 Female orangutans, for example, are known to feast on offspring that die of natural causes. Female marmosets have been observed killing then eating their live young. How Soon After a Litter Can You Spay a Cat?